Bermuda Coastal Scene - probably looking out towards Boaz Island, Somerset. Signed lower left: "Dodge MacKnight"
DODGE MACKNIGHT (1860-1950) was an American painter who forged a reputation in Boston art circles at the turn of the twentieth century as arguably America’s first modernist and, alongside contemporaries John Singer Sargent and Winslow Homer, one of the foremost watercolorists of his day. Through his work he held out a mirror that personally expressed “the scenic wonders of the world,” and “the solid and eternal base of continual communion with nature.” While many reviewers were shocked by the vividly-colored landscapes of his post-Impressionist palette, other, more progressively-minded critics greatly admired his intense hues and lively brushwork, as did widely-respected artists such as Philip Hale and Harvard University Professor of Art Denman Ross. His patrons came to include a host of Boston’s most prominent private and public collectors of the era. Macknight was born in Providence, Rhode Island in 1860. Though he passed the entrance examination to prestigious Brown University, he chose instead to pursue an artistic career, initially serving an apprenticeship with a theatrical scene and sign designer from 1876 to 1878. Following this endeavor he embarked on a five year period of employment with the Tabor Art Company of New Bedford, Massachusetts, a firm that manufactured reproductions of paintings and photographs. During these years he began painting in his spare time, and in December, 1883, using a loan from a friend as his basis of support, departed for Paris, enrolling in the studio of the eminent Academic painter and teacher Fernand Cormon. While a student at “Atelier Cormon,” Macknight studied alongside Toulouse-Lautrec, Emile Bernard, Louis Anquetin, Eugene Boch, and John Peter Russell, and from 1885 to 1887 exhibited at the Paris Salon (Macknight being one of a select few students whose work was chosen for display). Boch and Russell introduced Macknight to the Parisian avant-garde, and it was Russell, an Australian Impressionist painter and portraitist much heralded in his day, who introduced Macknight to Vincent Van Gogh in March, 1886 (Van Gogh having arrived at Cormon’s studio in Paris from Antwerp on the 28th of February), and who went on to paint historically significant portraits of both Van Gogh and Macknight. (The Macknight portrait, executed ca. 1887, is the only known portrait of the artist, and sold at auction for $228,000 in 2007.) Shortly after meeting Van Gogh, and following a two-year stay in Paris, Macknight departed for the south of France, traveling from there to the Algerian coast. In March, 1888, he arrived back in France in the village of Fontvieille, northeast of the artist’s colony at Arles, where Van Gogh was then situated. The two artists met several times, with Van Gogh extending an invitation to Macknight to join the colony at Arles; though Macknight declined, choosing instead to continue his travels throughout Europe, the historical record reveals that they did explore in tandem the theory of disparate color complementaries, with the Dutch master even being influenced by his young American friend, executing one of his famous Sunflower canvasses (featuring orange flowers in a yellow pot, set against a turquoise background) after having viewed several of Macknight’s similar still-lifes (including a yellow pot on a violet foreground, and an orange pot on a blue one). 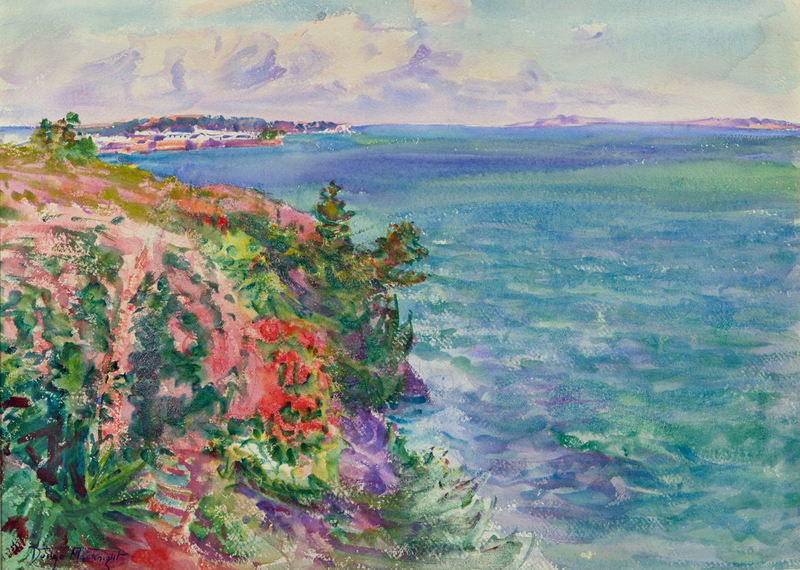 In 1888, following in the footsteps of Russell and Monet, Macknight made the first of many trips to the storm-tossed island of Belle-Ile-sur-le-mer, off the coast of Brittany, where, pursuing a passion for color shared and encouraged by his friend Russell, he produced a series of watercolors that many art historians believe are representative of his finest efforts. That same year Bostonians were first introduced to Macknight’s work when he exhibited thirty-five watercolors of European scenery at the Doll and Richards Gallery. (Excepting the years 1893-1896, he exhibited there annually for the balance of his career.) Another exhibition of his European landscapes took place in 1890 at John Singer Sargent’s studio in London. In 1892, while in Orihuela, Spain, he married the governess of Russell’s children, Louise Queyrel, a French woman from Valserres, in the Haute-Alpes, and in 1897, after spending eleven years traveling extensively throughout Europe and the Mediterranean, he returned to America with his wife and young son, initially living in Mystic, Connecticut before settling in East Sandwich on Cape Cod, Massachusetts, where Macknight would reside for the rest of his life. Macknight reached the apex of his career during the 1920s, with his annual watercolor exhibitions at the Doll and Richards Gallery attracting crowds of visitors and frequently selling out within hours. His stature was such that in 1921, his watercolors were exhibited at the Boston Art Club, along with those of Sargent and Winslow Homer, America’s other preeminent watercolorists. Two years later, sixty-three of his watercolors were featured at the Exposition d’Art Americain in Paris, again with Sargent’s and Homer’s (as well as the work of the young sculptor, Paul Manship). The Boston architect Frank A. Burns recorded his impressions of the famous American watercolorists’ show in Paris, writing, “Just before (viewing the Salon) I had seen the remarkable exhibition in Paris of four Americans: Sargent, Dodge Macknight, Winslow Homer, and Paul Manship. There were fresh and interesting motives in the American work that seemed wholly lacking in the long corridors of the Salon.” This exhibition of the three American watercolorists (plus the sculptor, Manship) comprised an event that is mentioned, and its significance weighed, in every history of American watercolor. Macknight’s reputation at the conclusion of the nineteenth and first quarter of the twentieth centuries engendered an interest in his work that resulted in its display at many of the Northeast’s most prestigious venues, including the New York Water Color Club (member); the Boston Water Color Club (member); the New Society of Artists, New York City (member); the Hampton Institute, Hampton, Virginia (1893); the Gallery at the Fiske Library, New Orleans, LA (1893, 1899); the St. Botolph Club, Boston (1894, 1907, 1912); Mrs. Henry Whitman Studio, Boston (1895); the Pennsylvania Academy of Fine Arts Annual Exposition (1895-1899); the Artist’s Institute of Chicago (1895-1924); H.S. Hutchinson and Co., New Bedford (1898, 1902); the Boston Art Club (1899); the Artist’s Association of New Orleans (1899); the Black and White Club, Plymouth, MA (1902); the New Orleans Art Club (1904, 1932); the Twentieth Century Club, Boston (1907); the New York Armory Show (1913); the New Bedford Art Club (1920); and the Vose Gallery, Boston (1920s; several exhibitions, all sold out). His work is currently represented in several of the country’s major public collections, including the Museum of Fine Arts (Boston); the Addison Gallery of American Art, Andover, MA; the Cleveland Museum of Art; the Brooklyn Museum; the Fogg Art Museum, Harvard University; the Rhode Island School of Design; and the Worcester Art Museum. His watercolors were included in the exhibition The Bostonians: Painters of an Elegant Age (1986-1987), which traveled from the Boston Museum of Fine Arts to the Denver Art Museum and the Terra Museum of American Art (Chicago). In 1931, Macknight’s wife and son died. Though he lived for another nineteen years, he never painted again. Perhaps a fitting epitaph comes via the declaration of the well-known collector of modern art, Albert Gallatin, that Macknight, in his opinion, belongs in the ranks of Whistler, Homer, Sargent, Marin, and Demuth as one of the all-time great masters of American watercolor.